Is Contaminated Land a Problem? Whether contaminated land is problem largely depends on 2 main factors, does the contamination provide a risk to site users, and/or does the contamination provide a risk to the public and wider environment? In the simplest terms you will need to have at the very least a Phase I report on the site, listing a history of potentially contaminating activities on the site, and most likely a Phase II site investigation report to show if contaminants are present and what risks they pose. Environmental Consultants will do these for you (this blog post may help guide you). ‘Contaminated land Problems’ as we’re calling them, are determined by 3 pieces of legislation. Planning Advice Note 33 (Scotland), or The model procedures for the Management of Land Contamination, CLR 11 (England & Wales), and Part IIA of the Environmental Protection Act (UK). PAN 33 and CLR11 are the most use in answering the ‘is contaminated land a problem’ question as they dictate that a site must be ‘suitable for use’. A certain level of contamination may or may not pose a risk depending upon the circumstances, for example an allotment on contaminated land will give you different concerns to those that you would have if you were building a car park on the same land. Part IIA is less influenced by the site use and mainly on the risks posed by the contamination. Part IIA requires local authorities to identify contaminated land which can pose a risk to human health and/or the environment, and promote remediation when risks are identified. 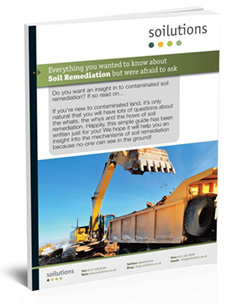 Our guide to soil remediation includes ‘why remediate’, your copy is available for download below.